Shadowy Mr Big behind worldwide criminal organisation. Known variously as 'Jesus', 'Christ', 'Lord', and 'Saviour'. Persistent rumours of a brief appearance in Palestine though unknown in official records. Cult members convince themselves JC is alive today. Intelligence suggests never actually existed. How could we have Christianity if its central character did not exist? The answer is that human ingenuity and cunning is matched by mankind's equally monumental credulity and wishful thinking. The idea of a Jesus is all that is required. "Many are those who trade in tricks and simulated miracles, duping the foolish multitude; and if nobody unmasked their subterfuges, they would impose them on everyone." Lying for God – Copy and Glorify! Would they lie? They said it themselves. Trials and Errors – Theology as drama, masquerading as history! Jesus meets his detractors. Six trials and myriad contradictions! After the war with Rome, the choice facing the Jews was given a human face and made an atoning sacrifice. Jesus was not just a lamb but a goat!  From the authentic pen of lying Christian scribes !! A Jew and a handful of pagans are pressed into service as unwitting "witnesses" for a phantom saviour. "Suffering martyrs"? The fable of Christians thrown to the lions is as familiar as Goldilocks and the Three Bears. Would the early believers have died for a lie? Consider the evidence for that supposed "persecution" – Holy Mother Church invented heroic origins! Laugh or cry? - The fabrication of "Saint George". How a sacrilegious 'sorcerer' outwitted the priests! The Gospel writers created a maritime stage for a perambulating messiah. It is a palpable nonsense. Drill down on the Christian timeline and what you find are endless anomalies and mismatches with real history. How can the chronology of the "most important event in history" be so uncertain? Because it is not history at all but a fable retrofitted into history. 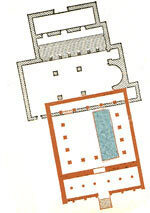 "Jesus' pavement" – in fact, Hadrian's east forum. For two hundred years, the municipality of Aelia – the erstwhile city of Jerusalem – was demonstrably and triumphantly pagan. It was upon not the city of Herod but the 2nd century city of Hadrian that the gospellers imposed their fable. The Siloam stream terminated in a "sacred" pool where Hadrian built a temple. 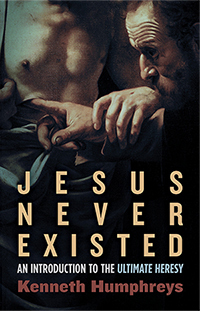 Where Jesus venues were not entirely unstated, vagueness left plenty of scope for imaginative "placement". The venues were shrewdly chosen to scupper the competition and expropriate the magic of earlier gods. A non-believer healed by Jesus? A Jesus miracle at Bethesda? In the northeastern sector of the new city of Aelia, just beyond the eastern forum, Hadrian's architects re-developed an ancient shrine of healing. It was "useful", therefore, for gospeller John to have his divine hero perform superior magic at the very spot that the god Asclepius worked his wonders. Art – but not history. Dolorosa – The Way of Sorrow or A Comedy of Errors? Jerusalem's bogus pilgrim trail. The streets of the Via Dolorosa were never traversed by Jesus, with or without his cross. The roads of the Old City of Jerusalem follow the line (but at a level some ten to fifteen feet higher) of the town built by the Roman Emperor Hadrian after 135 AD – a century too late for any Christian messiah. Ancient Jerusalem was encompassed by a necropolis. But empty tombs and empty tales of Nicodemus and Arimathea do not a saviour make. Holy? The Jesus theme park shared by rival six rival franchisees. What chance that the "most sacred site in Christendom", the so called tomb of Jesus, is anything other than a grotesque and palpable fraud? Waking the Dead? – Did Jesus really "raise" anyone? Of the 35 miracles supposedly performed by Jesus three were nothing less than restoring life to the recently dead. No claim has ever been made that they were "resurrected" to life eternal in a supernatural body in the manner of Jesus. That cachet was for JC alone. But were the three ever raised at all? Who saw what when? Does even a word of it make sense? Of the dozen or so post-death appearances claimed for Jesus Christ, the "most detailed" (a whole 20 verses) is the one reported solely by Luke, "on the road to Emmaus." Oddly, for this most important of occasions, JC materialized to two unknown characters, Cleopas and the "other one". History – or a fiction inspired by faith? "James Ossuary" Declared Fake  Official! Down the Toilet! Faker Arrested! Declared fake  Official! The "James Ossuary". How an Israeli entrepreneur outwitted the 'experts'.